Originally printed on January 24, 2019 in the Gravesend Reporter. 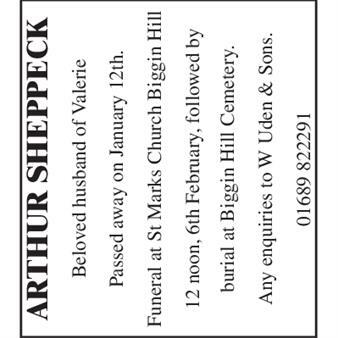 ARTHUR SHEPPECK Beloved husband of Valerie Passed away on January 12th. 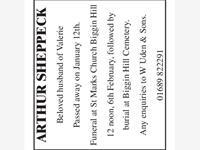 Funeral at St Marks Church Biggin Hill 12 noon, 6th February, followed by burial at Biggin Hill Cemetery. Any enquiries to W Uden & Sons. 01689 822291.